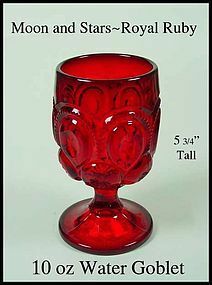 This true Royal Ruby (not amberina) Moon and Stars 10 oz water goblet is in excellent condition! It was made by Fenton for L.G. Wright. 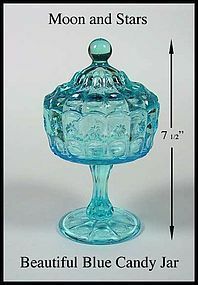 This tall blue Moon and Stars covered candy jar was probably made by L.E. Smith, and is in excellent condition! 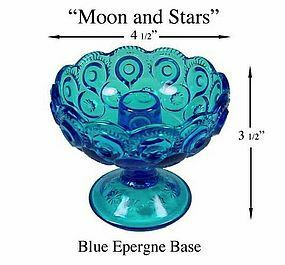 This ftd blue Moon and Stars epergne base was made by L.E. Smith. It is in excellent condition! 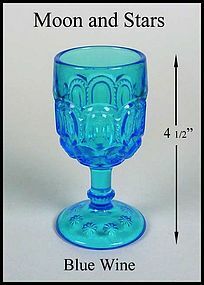 This Moon and Stars blue stemmed wine goblet is in excellent condition. We have 6 of these wines available @ $11.00 each. 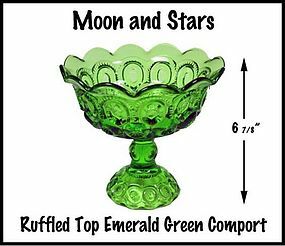 This Emerald green Moon & Stars compote is 6 7/8" tall and 7 3/8" wide and in excellent condition! Nice color! 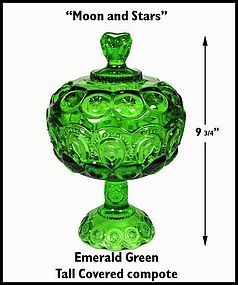 This emerald green 2 pc covered compote is in excellent condition! Probably one of the most beautiful colors of green by any company! 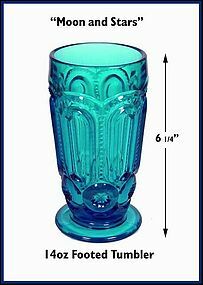 This bright blue Moon and Stars 14oz footed tumbler is in excellent condition!